The Law Offices of John M Alton Co, LPA knows that when someone suffers a personal injury in Dayton, there are always many questions to ask. Who was at fault? Will I ever recover? Should I speak with a lawyer? The answer to these questions is yes. Sometimes, people who are hurt in an accident feel that they cannot do anything about it. Speaking with an experienced attorney, like me at The Law Offices of John M Alton Co, LPA, is the most appropriate step a person can take to start resolving their current spinal cord injury issues. I will work thoroughly and diligently in reviewing your legal issues and providing you with a path forward on your spinal cord injury case that will work to your satisfaction. My objective is to provide for you a real sense of financial compensation for your pain and suffering. Such results take time and effort. 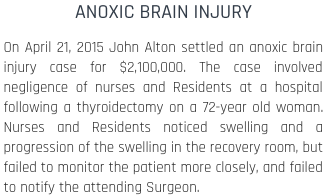 With my extensive practice experience at The Law Offices of John M Alton Co, LPA; I will put in all of his effort to getting you appropriate compensation for your injury. The Law Offices of John M Alton Co, LPA appreciates and can help you knowing that your spinal cord injury case needs to get resolved. Their is no compensation, for instance, for the emotional pain and suffering your injury has caused you. 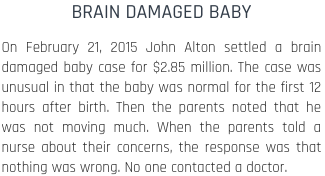 The Law Offices of John M Alton Co, LPA understands that many people suffer emotionally due to their injuries and deserve compensation. If you have been physically injured, you need representation now. If your case has not moved forward to the standards you expected during your recovery; and you feel wronged, allow my help at The Law Offices of John M Alton Co, LPA to assist you. 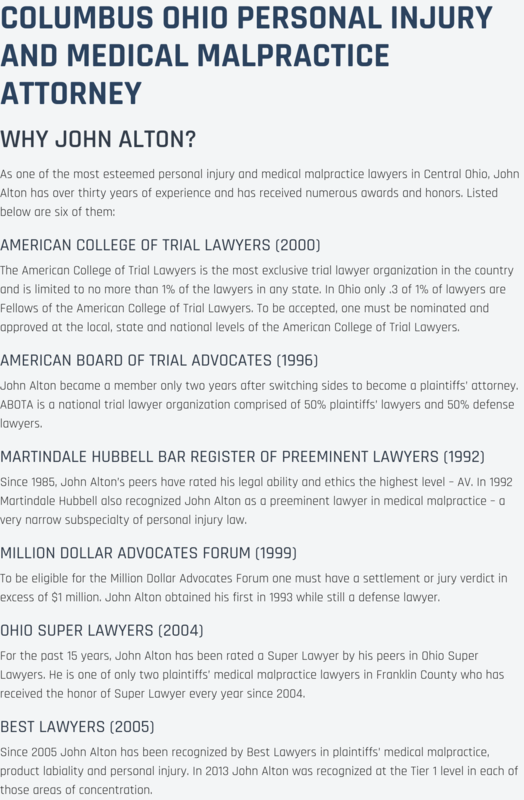 Here at The Law Offices of John M Alton Co, LPA, our Dayton area lawyers have experience handling various spinal cord injury cases that may seem daunting to the victim. If you are ready to work with dedicated professionals, give us a call at (614) 221-6751 today.